When you want to see her succeed, put her on the softest, most stable girl‰Û¡ÌÝåÁÌÎÌÌ´åÈs beginner board in snowboarding. 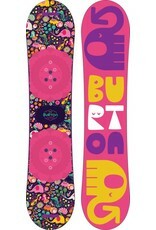 The Burton Chicklet‰Û¡ÌÝåÁÌÎå£Ì´å¢ is the ticket for girls who want to start snowboarding and quickly learn the basics. What makes it so perfect is the beginner-friendly combo of a convex base with upturned edges and the softest flex possible so that even the lightest weight riders can master turning and stopping. The catch-free feeling continues with a flat profile from nose to tail that‰Û¡ÌÝåÁÌÎÌÌ´åÈs extra stable for better balance and board control. Attach the Riglet accessory to the nose or tail of the 80-120cm sizes to tow her around and get her comfortable until she's ready to add bindings.